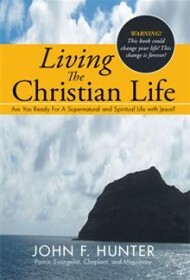 Living the Christian Life is a handbook of basic Christianity, written by John F. Hunter, a retired prison chaplain, missionary, pastor, and evangelist. Hunter’s presentation is straightforward and doesn’t require previous knowledge of Christianity. It’s a concise distillation of Christianity without any of the denominational trappings. In 13 short chapters, Hunter simply and succinctly presents the Christian message. While his chapter titles are creative, each represents a foundational tenet of the faith. For example, “Am I In or Out?” speaks to salvation and how to become a Christian. Other chapters explain Baptism, the Lord’s Supper, the Holy Trinity, prayer, worship, fellowship, witnessing, trusting God, and finding God’s will for your life. The process of spiritual growth after becoming a Christian is reinforced throughout. Hunter intersperses personal anecdotes and Scripture passages into the narrative to support the topic at hand. For instance, the chapter titled “God Speaks,” which emphasizes the importance of reading the Bible and memorizing the Word, features this Scripture: “And Jesus answered him, saying, ‘It is written, That man shall not live by bread alone, but by every word of God.’” Readers will also appreciate the author’s deft explanations of concepts that might be new and misunderstood by the uninitiated. When defining “church,” he acknowledges that many relate the word to the building where congregants meet. In fact, he notes, “church” refers to the congregation itself, or the body of believers—no matter where they meet. Living the Christian Life will appeal to a wide audience, including those just curious about Christianity, serious seekers of Jesus, and even current believers. Pastors will find this an easily understood guide perfect to share with people considering church membership. Sunday school teachers of older children and youth may find it a worthy supplement to their teaching materials. And finally, this book would certainly be one for church librarians to consider adding to their collections.